Could you tell about yourself? I was born in Osaka Japan where I have lived most of my life. Many martial artists would instantly recognize my early childhood as that designed to build character and discipline. In Japan, this was taught to focus one’s Ki or inner energy. 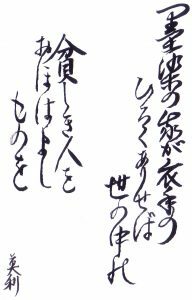 This is an important part of calligraphy and one sees it as an essential element in many of Japanese arts including the Martial Arts. It was in such a household at the age of six that I began studying calligraphy and have trained in the art all of my life. In 1989, after winning several national competitions in Japan I earned the rank of Master or Shihan in Japan’s most prestigious calligraphic society the Bokuteki-kai. This society is devoted to training professional calligraphers and so advocates only the most traditional Japanese Calligraphy. While I loved this I also felt trapped by it. As an example, one of my favorite personal works at the time was done with blue watercolor and written using a broken wooden chopstick. In the early 90’s I moved to the United States. When I moved to the United States I felt a liberation that I cannot describe and promptly began to work with different mediums such as western-style handmade papers, collage, and mixed-media. I thought the results were beautiful and I could not get enough of it. An example of the work I was doing at the time is this suminagashi (Japanese marbling) which I did on paper I made myself. This is a poem by Nakabun about being separated from one’s lover and roughly translates as “To he that truly knows my heart, I would show the tears I shed at night”. 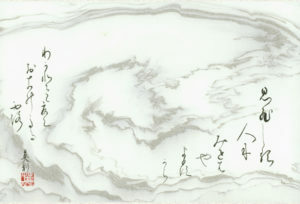 This is an example of traditional calligraphy on non-traditional medium. One can also see that with calligraphy the beauty of the empty space can be as important as the calligraphy itself. The Internet was relatively young when we started our on-line custom design business and this year we will celebrate our 15th anniversary in business. We started mainly focusing on artwork but gradually have done more custom designs for personal and commercial use. Today we work digitally with clients around the world on projects ranging from book illustrations, magazine and ad illustrations to calendars and custom work for people’s homes. Could you tell about the technique you use in your works? What kind of technical materials are you using in your work? I still mainly use traditional materials such as Japanese brushes, paper, ink-stone and sumi-ink which I grind myself. This much really has not changed in a thousand years. Once the ink has dried, however, it is all technology. And the Adobe Creative Suite allows us to transform the designs into a variety of mediums. As one example we used Adobe Premiere to edit videos we have taken of the calligraphy being created so in our learning CD’s students can see not only the final example and explanation of how it was created but can actually see the example itself being created. This is very important because Japanese Calligraphy is all about movement and the rhythm which are things that cannot be properly shown in a book. And for the learning CD’s we use other programs in the Creative Suite to create an outline of the example and then we can add the stroke order and direction of the stroke which is very helpful to students that may be unfamiliar with kanji. These pieces then combine to give the student powerful resources to properly learn Japanese Calligraphy. Could you please tell about your artistic “nourishment” sources? Many times it is nature that inspires my artwork: The rhythm of a gentle breeze on my face or watching the movement of a bald eagle in the sky. Calligraphy is very much about movement so I am more in tune with the rhythms and patterns around me and I try to capture this in my art. And with custom work there is always a story behind the design – sometimes it is as simple as a campaign statement and other times it is a deeply personal story. The lives, hopes, dreams, and fortitude of people is always inspiring and I try to bring this to the artwork that I am creating. The sample is shown on here on the right. Could you please tell about your working atmosphere? Is that big, silence and dispersed room, or? My preference is certainly for large, uncluttered, well-lighted space with jazz softly playing in the background. My studio in Washington was such a place and it was a joy to work in. There were several large tables as well as a drafting table and a desk. Most of my art supplies were stored in adjoining rooms so the whole space was functional and serene. We had a separate area devoted to photographing the artwork and a computer room. The studio looked out over South Puget Sound in Washington State and having nature so close was always an inspiration. However, almost two years ago we lost the studio and house in a landslide and so today my workspace is quite modest. This has also forced me to concentrate more on design work rather than on larger acrylic works. One advantage is I have moved to Hawaii to make traveling to Japan easier and here I have some of the best light in the world. Is it difficult to learn to Japanese calligraphy? Can people who’re not Japanese learn easily? Several years ago I started my own school in the United States teaching calligraphy. It is certainly possible for non-Japanese students to become quite good in a short period of time and all it requires is a bit of know-how and steady practice. If one has experience using a brush then things move along more quickly. In either case, one should spend a little time every day practicing the brush strokes until the basic strokes come naturally. To learn the block font this can take as much as a year to become proficient. Based on my own teaching I started publishing a series of learning CD’s that teach Japanese calligraphy. These were picked up by Amazon.com and now are sold worldwide. The first four CD’s cover a year of study and the results have been very good. I have had the pleasure of grading the works of students that use this method and the results have been impressive. With that said, Japanese calligraphy is a very broad area and one can spend a lifetime learning the subject with most artists specializing in a particular font or style. Though one does not need to spend a lifetime to learn to enjoy and become adept at the art. In Turkey, there is so huge history and accumulation about calligraphy art. But today, unfortunately, there is not so much interesting for this art. And we know that there is same huge history and accumulation about calligraphy in Japan. Today, what’s the condition of calligraphy in Japan? Still are there enough interesting for this art? When I was asked to do this I thought of Kouichi Honda who is a Japanese national doing Arabic calligraphy. There was even an article about him on CNN in 2000 called Japanese artist specializes in Arabic calligraphy. I was pleased to see this and to see that Japanese have taken such an interest in your beautiful calligraphy. Japanese Calligraphy is very popular in Japan. I believe I once read that over a million Japanese list calligraphy as a hobby. And this makes sense because Calligraphy is so entwined with the culture. In Buddhism, it is a common practice to copy sutras, in the tea ceremony, flower arranging, and bonsai it is traditional to have a calligraphic or sumi-e work in the background. And while Japanese homes are becoming more westernized in design, there is usually one Japanese room with a tokonoma where calligraphy is traditionally displayed. To some, Calligraphy is not simply an art form but it is also a way of training the mind. And much of the discipline and training required to do calligraphy well carries over into other areas and into life. Dating back to the 16th century, Japanese most famous swordsman Miyamoto Musashi was also a renowned calligrapher and in his Book of Five Rings recommended the study of calligraphy. 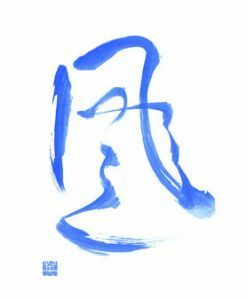 The reason being that with calligraphy, as with the tea ceremony, as with Martial Arts, everything one does is part of the art. There are no do-overs, no erasing, no retouching – there are no second chances: all movements are an integral part of the art. The speed with which the line is drawn. The pause. The fluidity of one movement into the next. A powerful line. A gentle line. All visible and all right there in the final work. To do this requires focused attention and discipline. I imagine that Arabic Calligraphy would have a similar exercise that we practice. The student is to do a 100 character scroll. If a mistake is made, the student must start over from the beginning on a new scroll and will continue until the work is completed without error. Every student does the first character perfectly, but it takes a strong mind to do the final character as well as the first. What do people think (who are not Japanese) about Japanese calligraphy? Are there any people who’re learning this art from out of Japan? Japanese calligraphy is based on pictographs with the earliest characters looking like the item they represented. One form of art is to go back and recreate the image with the character. An example of this is the design for Dragon which I show here. This style of Japanese Calligraphy art has an appeal I believe because it certainly has the Japanese Calligraphy look and at the same time one can look at the design and have an idea of the meaning. One can also think of Japanese Calligraphy as purely abstract art. This was used successfully by artists such as the Spanish Artist Joan Miro. Though in Miro’s case it was truly abstract art influenced by calligraphy. With Japanese Calligraphy, one gets not only the abstract quality, but there is also a meaning to the design. An example of this might be the design “Wind in Blue” which is based on the kanji for kaze (wind). With the motion of the brush and the blue watercolor, one can almost feel the wind coming off the blue sea. And in some cases, Japanese Calligraphy can be abstract art even to Japanese. This is because Japanese Calligraphy has a cursive font that is very difficult to read – indeed even experts can have trouble with the cursive font. The example I show above of the poem fragment by Nakabun is a classic example. This is not only written in a cursive font but it also uses a now obsolete form of kana making it so that only an expert would have a chance to be able to read the design. In this sense, Japanese calligraphy can be abstract art even to Japanese! 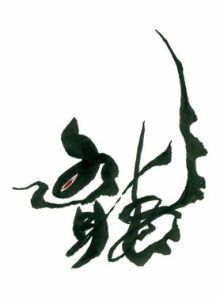 The example of the poem by Nakabun brings to mind the fact that Japanese Calligraphy is gaining popularity in China as well. Chinese have kanji (also known as Chinese characters). What it does not have are the kana which are phonetic elements created in 6th century Japan to represent grammar and verb tenses and other elements unique to the Japanese language. The kana are simple compared to kanji and when done in a cursive font it gives the calligraphy long, almost vertical lines. This is not a style one can do with pure kanji and so while Chinese may not be able to read the calligraphy, they are taken by its lovely form. And it is this specific element that clearly separates Japanese from Chinese Calligraphy. Who are your favourite artists / calligrapher alive today? My favorite is Sakaki Bakuzan who was born in 1926. He is a free-thinker that years ago turned his back on the establishment to create his own form of calligraphy. He is one of the few that were able to create what he wanted and still remain immensely popular. I own and refer to several of his books which show his encyclopedic knowledge of calligraphy arts and materials and his true love for the art. Can you use your art in the business world like illustrator, photographer or graphic designer? Absolutely. A large part of my work is creating Japanese Calligraphy elements for graphic designers with the designs then being used in books, magazines, on products and as part of a business logo or in marketing materials. 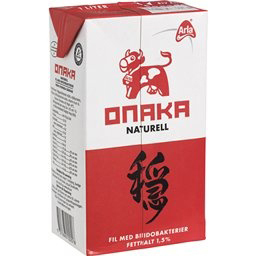 For some specific examples, I have done calligraphy for a soy product by Arla Foods that is marketed throughout Europe even today. I have also worked with Mr. Yoshida’s Cooking sauce for calligraphy to be used as part of the background on a product label. I have also done illustrations for dozens of books, CD Covers, advertising campaigns, posters and so on. There is certainly a demand for Japanese Calligraphy as a design element. Of all these projects, though, the most difficult for me to grasp is I have an agent specifically for the digital wireless phone market who supplies artwork to companies such as Moviso and 9Square to be used as wallpaper on digital phones. Each quarter tens of thousands of my designs are downloaded to be used on digital phones. I still can’t grasp this one. With all of this technology though my art is still created the traditional way where I make my own ink by slowing grinding an ink stick on an ink stone and then use one of my hundred brushes on handmade Japanese paper. Once the ink has dried, however, we use the latest in hardware and software to either create a digital design that can be presented to the customer for review or create a final product ready to be sold on-line as a digital download. All of my custom work is done remotely using the internet so we use scanning software to bring the image into Photoshop where color adjustment and minor cosmetic touch ups are done. The image is then converted to a PDF file for presentation to the client. In this manner the Adobe Creative Suite allows me to collaborate digitally with clients around the world. Besides completely custom work, I also offer stock Japanese calligraphy images for commercial use at our website StockKanji.com. To make this happen, the process is even more advanced as we offer options not only for commercial designers but also for individuals looking for designs for craft and body art. With the later, once the designs are scanned, line art for the design is created and the image is then vectorized in Illustrator and then labeling and descriptions are added in InDesign with the final product for non-commercial use being a print-only PDF file. Much of this process is automated which allows me to concentrate on what I do best which is the calligraphy itself. I am currently working with Kachi-Do, a large on-line Martial Arts supplier in the United Kingdom to create designs to be used as an integral part of the website. This is a large project involving many of our stock images from StockKanji.com and also custom designs to be used as logos, seals, scrolls, and artwork. The final website will be a visually appealing fusion of modern graphic design with traditional Japanese Calligraphy elements. According to Mark Lord, the owner of Kachi-Do, “I believe there is a massive demand, the task before us is to make Japanese Calligraphy more and more accessible, this will be achieved by utilizing the technology available such as Master CS3 and developing products that make it easier and more cost attractive to all, this is something we have recently discussed in the development of a package for translation software and a library of designs for our website Kachi-do.com! I believe that not only is it becoming more and more a common requirement and preference to have your Personal Name or Company name translated into other languages such as Japanese or Chinese, but more and more languages as the world gets smaller , this requires dedicated experts like yourselves to carry out the translations correctly offering a choice of styles to suit each individual, company or purpose, these services will become more and more popular and demand will make them more widely available with increasing translation services in many other languages including Arabic as the world becomes smaller and smaller year on year. Today, there is much technological development in the visual communication. And some traditional arts like calligraphy is in very different position. What do you think about this subject? Your question brings to mind one of my favorite sayings onkochishin which roughly translates as “respect the past, create the new” and suggests that it is only by studying and knowing what has come before that we can truly create something that is new. Indeed at the heart of my work is a lifetime of studying traditional calligraphy and it is being true to this that I think makes my art what it is – regardless of the medium or materials that I happen to be using. Technology allows an artist to reach more people and to do so much more with the design. There will always be room for the completely traditional but as the world adapts and changes Japanese Calligraphy to its own taste, technology acts as a catalyst for the change. Do you have any message to Turkish calligraphers and Photoshop Magazin readers ? Thank you very much for this opportunity to share my work and to talk a little bit about Japanese Calligraphy. And I do hope designers will consider using their cultural calligraphy in their design projects.